ManageEngine, the real-time IT management company, today announced the general availability of the Enterprise Edition of Password Manager Pro, its privileged access management software. Designed for large enterprises, the new edition combines enterprise-class scalability, security, performance and affordability, facilitating highly secure and easy management of shared sensitive information such as passwords, documents and digital identities. Privileged Session Recording – Dual Controls: Video records, archives and plays back privileged sessions for forensic audits. Another administrator can monitor sessions in parallel and terminate suspicious ones. 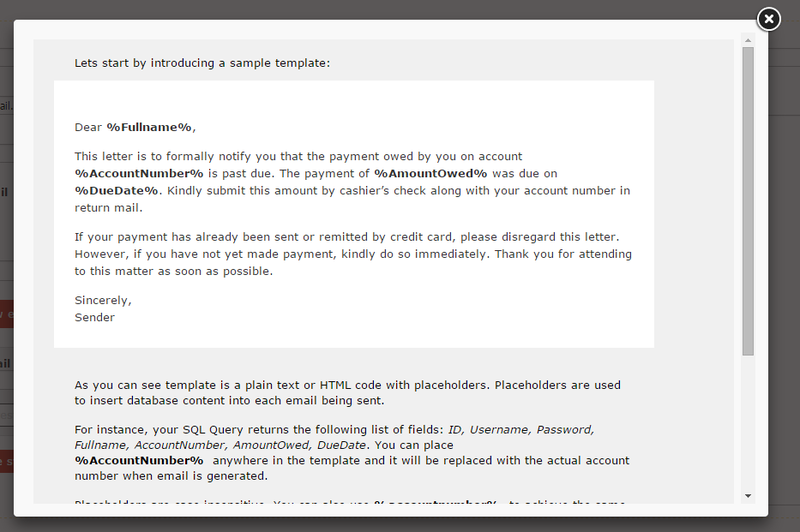 If you are already own MassMailer template v1.x you can upgrade to version 2 for $20. 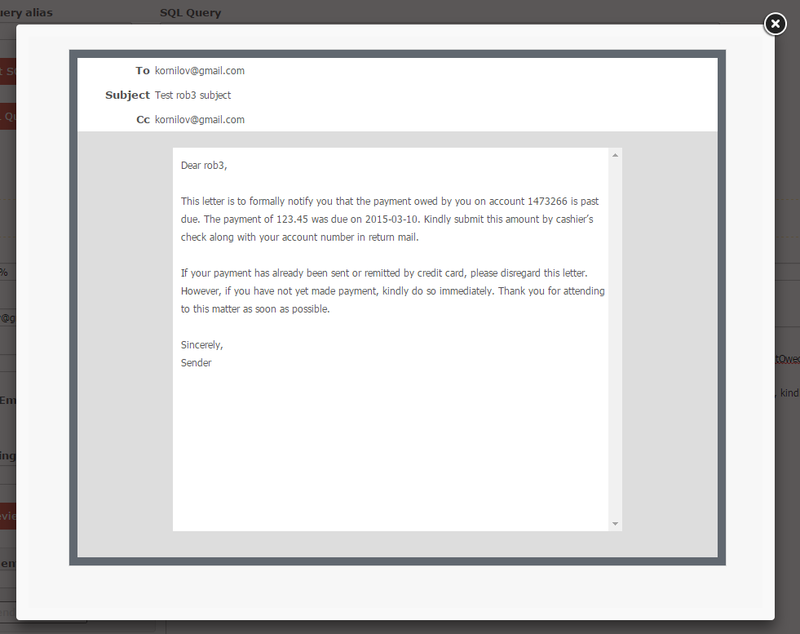 MassMailer template is available to users of PHPRunner 8.x, ASPRunnerPro 9.x, ASPRunner.NET 8.0. 1. Make sure you specified correct SMTP settings in PHPRunner project. SMTP settings can be found under Miscellaneous->Email settings. 2. Create a new task. For one off tasks like email newsletter choose Interval Type 'manual'. 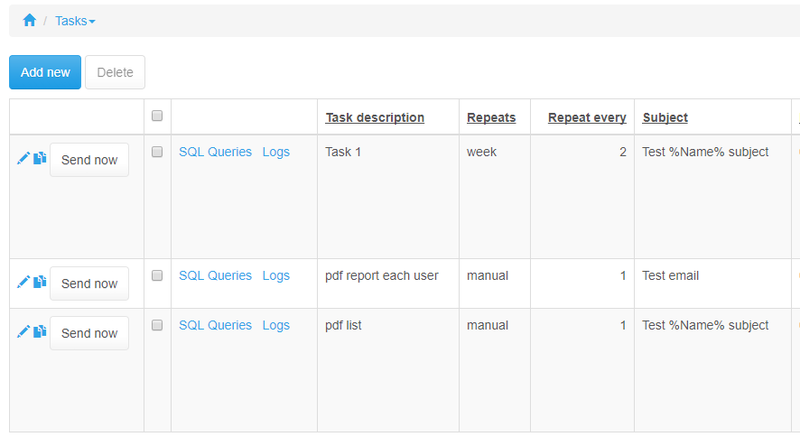 For recurring tasks like daily reports choose Interval Type like 'day'. 3. 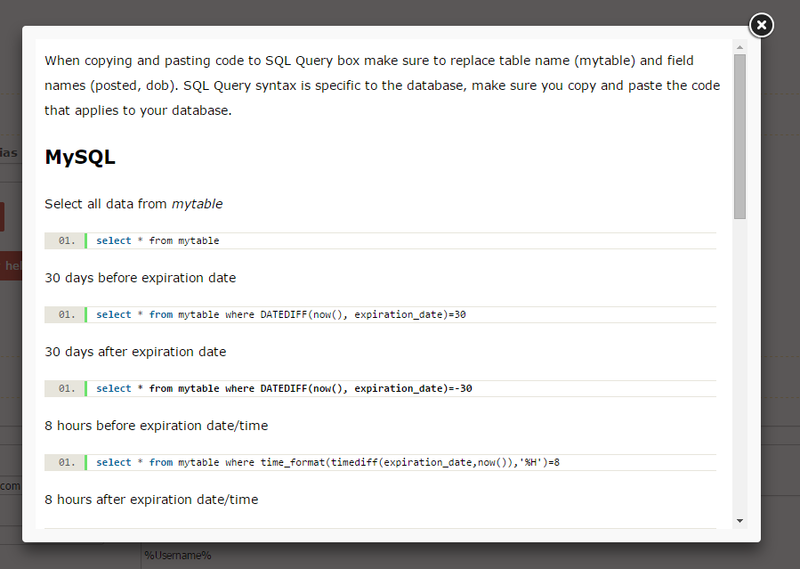 Enter SQL Query, make sure it returns correct data. 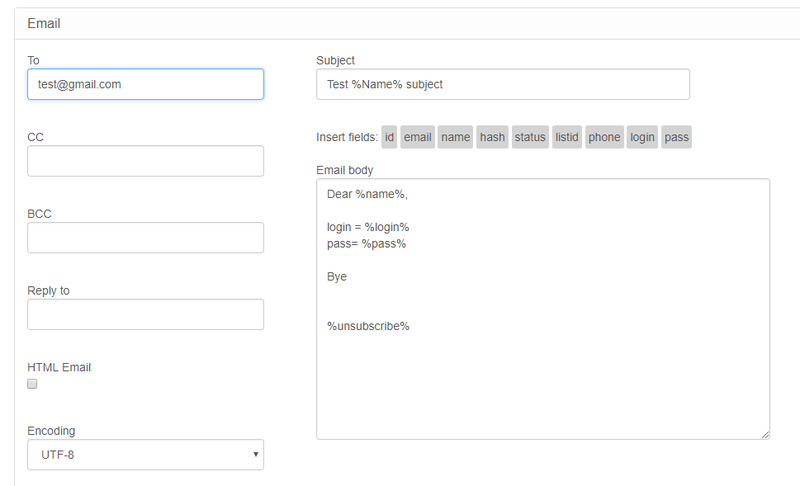 Populate email fields like 'To', 'Subject' and 'Email body'. Preview your email. Send test email. If everything looks good save your task. 4. Schedule a cron job to run cron.php page once a day or once an hour. If your website runs on Linux web server and you have access to crontab file you have two options here. The URL to schedule is http://website/massmailer/cron.php. The following script executes the php script every hour by calling the URL using WGET. The -q option indicates quite mode. The "-O temp.txt" indicates that the output will be send to the temporary file. If you are not sure how to schedule a cron job open a free account with monitoring service like Montastic and add cron page URL to be pinged once a day or or once an hour. I've created a task but don't want it to run yet. Can I make it inactive? Yes, you can choose Interval to be manual and it will not run until you start it manually. 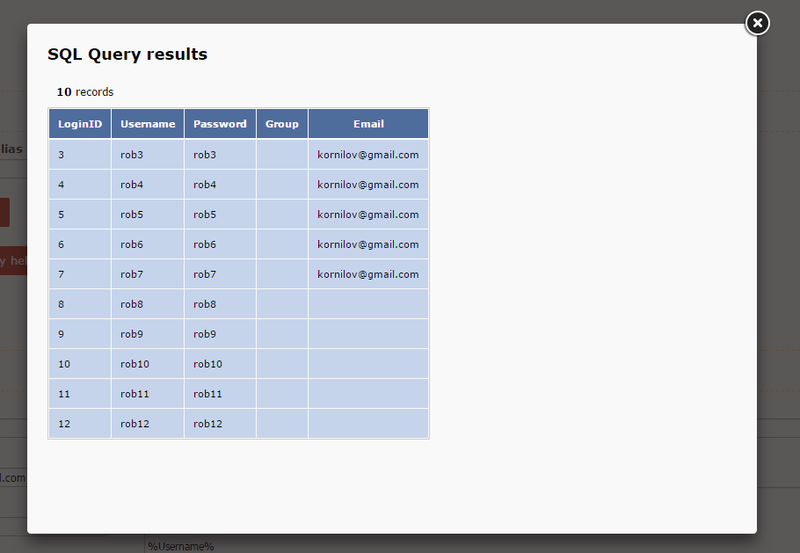 My emails addresses are stored in the database field. How do I setup this? In TO field specify %EmailAddressField%. Instead of EmailAddressField use the actual name of the field that stores email addresses. This field is optional and can be left empty. Use it when you need to update a record in the main table after email is sent. Typical use includes updating Status field with value like 'sent' or update EmailSent field with the current date/time. Note how we reference the field from the main SQL query via %main.CustomerID%. How to insert unsubscribe link? Simply insert %unsubscribe% tag anywhere in email body. Note that this tag only makes sense when email is sent to subscription list. The NEW GO-Global for Windows is released. Version 5 is an exciting, major release with many new enhancements. Download GO-Global for Windows v5 on www.graphon.com. A v5 license is required. Licenses must be on active support to be upgraded; check license status online. License upgrades can be requested online using the standard License Change Request. Gunakan produk GraphOn untuk mengakses aplikasi Windows Anda di any platform. GO-Global is the fast and secure application access and Web-enabling solution that makes it easy and cost-effective to extend the reach of your existing Windows, UNIX, and Linux applications to your company's network or the Web. Your applications run on a secure central computer (the Host), making them available to local, remote and mobile devices (the Clients) running just about any platform and operating system, including iPad, iPhone, and Android. The host-resident applications appear on the client devices just as though they were running locally. View GO-Global videos and see for yourself how GO-Global works. GO-Global for Windows provides local, remote and mobile users with instant access to Windows applications from anywhere. It eliminates the time and expense normally needed to rewrite existing Windows applications for the Web. And it’s much easier to deploy and use than complex alternatives such as Citrix XenApp or Windows-only solutions such as Microsoft Remote Desktop Services. GO-Global for Windows includes GO-Global Gateway, providing a secure, high-availability gateway to multiple GO-Global for Windows Hosts. It's the smart and easy way for your company to create a large-scale private cloud environment incorporating enterprise-level authentication, access control, load balancing, and more. In my last blog article, I told you about our decision to offer PRTG Network Monitor 100 for free. Since then a lot of new users have downloaded our software and started monitoring their networks, applications and virtual environments with PRTG. This is great, so a big "Hi and welcome!" to you! As I've already hinted at in my last article, I wanted to show you some hands-on scenarios, in which you can really benefit from PRTG 100. Let's get started—and also don't forget about all the other built-in functionalities and features like, for example, creating your own dashboards, alerts and notifications, detailed reporting, and mobile apps. In simple words: Have fun exploring PRTG! If you run a business you know about the importance of your webpage—whether it's used as a rudimentary business card with contact information, a shop window that enables visitors a glance into your services, or a web shop with your complete product portfolio replacing a retail store. If users have to wait too long for a webpage to respond, or if a web service is not available when needed, they probably will just move on to another vendor who can provide a smoother user experience. Although in modern offices we use a variety of tools—video conferencing and chats to dedicated collaboration tools—to communicate, email is still the main means of communication. Everyone can use it, no extra setup is required and you can easily bring external partners or customers into a conversation. Email systems are regarded as being thereliable method of digital communication, so any disturbances in email traffic can have grave consequences. If you want to read more about why we made PRTG 100 available for free and what this version incorporates (spoiler alert: it offers all the features of our commercial versions, only with 100 free sensors), just have a look at my last blog post. Please note: For the first 30 days you can try PRTG with unlimited sensors. After this time period is over, you'll be able to continue using 100 sensors for free forever. It is the complete deal—only for free! You cannot combine two licenses, so on one server you can install either the free PRTG 100 or a commercial license.